Our office fitout for legal training company Leo Cussen featured a combination of strong colours offset by natural woodgrains. Our brief was to install 159 H3 lockers with a Gantner Smartcard locking system and mail chute together with custom joinery. The lockers featured complementary finishes of Laminex Black and light blue with Abet Laminati Teal. 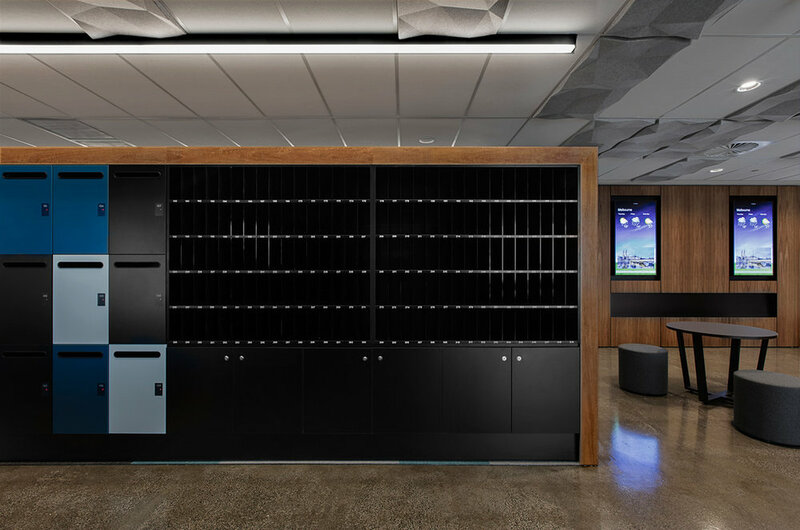 The locker banks were shrouded in a striking Spotted Gum veneer, which matched the adjacent wall finishes and integrated the lockers into the space. The Lockin team also provided other custom joinery that included pigeon hole units and lockable cupboard spaces for shared office resources. Making the locker bank a hub in the centre of the office. We were appreciative of the time we spent with Leo Cussen to understand the specific needs of teaching staff and trainees, allowing us to create effective storage within a space for the next generation of lawyers. A multi-functional storage hub in the centre of the office.